I like to read a good range of books. In any given month I’ll read a couple of chicklit books, some good quality fiction, a classic, a YA book, a cookbook….I also love non-fiction. As an oh-so-precocious child I developed a real hunger for learning and picking up knowledge, and to this day I love sitting down with a good book on current events, history, geography, science…. In this wikipedia age, where we can all google a fact at the drop of a hat, I love the longer, more in-depth information you get from a book. The narrative, the depth of research, the curating of material all means that I often finish a good non-fiction book feeling like I’ve truly learned something. If web articles and newspaper pieces are the splashy, fun singles of the writing and learning world (and as a blogger, believe when I say that’s meant with no disrespect! ), books are the lovingly crafted albums, full of detail, changes in tone, and storytelling. 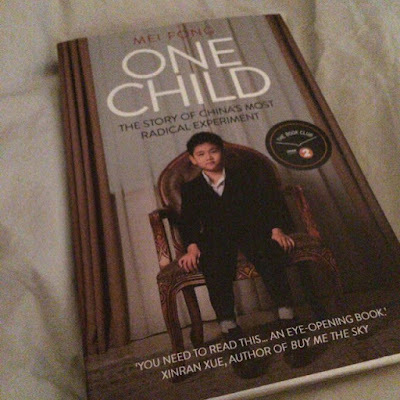 My latest non-fiction book was One Child, by ex-WSJ, Pulitzer Prize winning journalist Mei Fong. I find social history absolutely fascinating, particularly when it applies to the recent past. I’d read a few good op-eds on China’s recent relaxing of the one-child-policy, so when I saw this book on the shelf at Daunt, I had to pop it on my pile of books to buy. I always seem to emerge from that shop with a pile of things to read – no restrained ‘just picking up the book I came in for’ here! This is a great book, and an important one. Mei Fong weaves an interesting tale, taking in politics, economics and history in a clear and concise way, and seamlessly building in stories from the families and individuals affected by the strictures of the one child policy. I knew a fair amount about this legislation (as tight as China’s media control is, every so often a horror story would emerge), but I learned so much more while reading this book. I was really interested in reading and learning more about the more relaxed policies of the 1970s, with the mantra of fewer, longer, later when it came to children. I found myself wondering what kind of world we’d live in if that had been the policy pursued. There were several chilling sections of the book, and the human cost of the policy is vast. Fong’s exploration of loss, isolation and family breakdown exacerbated or created by the rules and regulations surrounding the one child policy left me saddened and deeply glad to live in a country where such decisions are not governed by bureaucracy. I hope that one day the same will be true of everywhere. China is by no means alone in trying to monitor and enforce family planning. One element I hadn’t really thought about with regards to the one child policy was the economics. I think when regarding something as brutal and huge as the one child policy it’s natural to focus more on the human right abuses, the cost to people, but I found Fong’s examination of the money side of things very interesting too. The fact that there will be many many millions of Chinese OAPs with a much smaller tax-paying-base to support them, is a big factor to consider, given the current importance of China and its economy in the global field. It’s also interesting to consider how many nations are struggling with family planning – while in this part of Europe we do not have government policies preventing families expanding, we do have several nations actively encouraging reproduction to help bolster populations – some nations such as Denmark are having babies at below replacement rate (currently c. 1.6), others like France are incentivising childbearing and slightly larger families through taxation and pouring money into childcare and education. What this means for politics, social structure and economics remains to be seen – I must find some books on this! Well written, well researched and full of great details, this book managed the perfect balance of hard-hitting facts and well crafted storytelling. And best of all for a piece of non-fiction, it’s made me want to go and learn more. If you’re interested in China, politics, history or social studies, I would heartily recommend this book. Previous Post Life is a mystery….Sushi less so!